The year is 1952 – two years prior to the discovery of the three-dimensional structure of DNA. At that time there were essentially two schools of thought regarding the class of organic compounds responsible for heredity, namely, proteins or nucleic acids. Two researchers Alfred Hershey (1908 – 1997) and his assistant Martha Chase (1923 – 2003) collaborated on a research project that they felt could unambiguously provide the answer to this fundamental question. The experiment described below is remarkably simple, precise and elegant; the ramifications of their results speaks for itself in regards to the discoveries that would follow including Watson and Crick’s elucidation of the structure DNA and ultimately the complete sequence of the human genome (2003). Hershey and Chase focused their attention upon the bacteriophage – a type of virus that preferentially attacks bacterial cells. 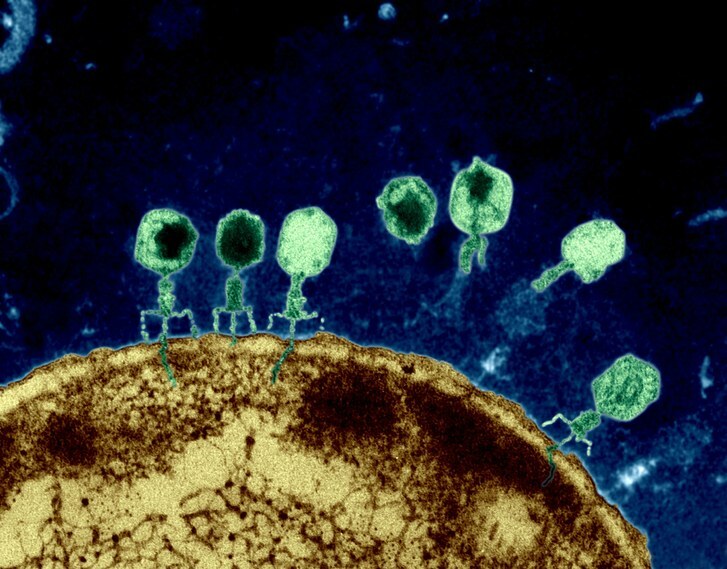 Like all viruses, the phage is made up of two distinct classes of compounds – a protein coat that surrounds a DNA core (there is also a class of viruses that use RNA as the infecting agent, the AIDS virus, for example). They labeled the phage (T2) with radioactive Phosphorus (P32) prior to introducing T2 to bacterial host. Phosphorus is predominantly found in DNA where it is a major constituent and found in protein in insignificant amounts. After infection, they found that P32 was no longer in the phage, but was found in the host indicating the phage DNA was transferred to the host. In the second experiment, they preferentially labeled the phage protein with radioactive Sulfur (S35). Sulfur is a significant part of the composition of proteins but does not exist in nucleic acids (DNA). In their analysis subsequent to infection, they found that S35 remained with the phage but was not found in the bacterium. Note, that Hershey won the Nobel Prize for his work in 1969 along with Max Delbruck and Salvador Luria. This kind of experimental approach also demonstrates the roles that imagination, dedication, persistence and creativity play in conducting scientific research.